We have decided that now it’s time to buy the little guy some more interactive toys. You know, the “cause and effect” toys, the ones that when he presses a button, out pops a little dude, or a sound plays, or something. Have you ever been to the toy store looking for an interactive toy for a 9-month-old? Ha! So many choices, it’s mind-numbing. This one does this, but this one does THIS! This one has these colors, but this one has THESE colors. And so on. I made a decision to buy a 2-in-1 toy. On one side is a piano that plays different songs when you hit the different buttons. The other side is a telephone with sounds playing from each button. Of course by the time he is old enough to use a telephone we won’t have them that look like this anymore, but that doesn’t really matter. 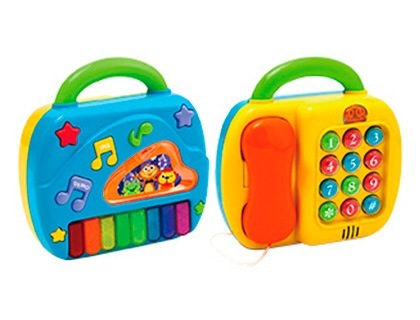 The toy manufacturer probably made a bunch of these in the ’90s and they’re just praying they can sell thru them all before land-line phones disappear completely.